Emily Cicali, Pharm.D., received her Doctor of Pharmacy degree from Philadelphia College of Pharmacy, University of the Sciences in 2015. She then completed a Pharmacy Practice Residency at Tabula Rasa HealthCare in Geriatric Personalized Medicine. After her residency, she was hired to work Tabula Rasa HealthCare at as a Research Pharmacist, as well as adjunct faculty at the Philadelphia College of Pharmacy, focusing on clinical pharmacokinetics and pharmacogenomics implementation. In 2017 she decided to fully transition to academia, which led to her completion of a fellowship in pharmacogenomics at the University of Florida. Cicali is now a Clinical Assistant Professor in the Department of Pharmacotherapy and Translational Research. 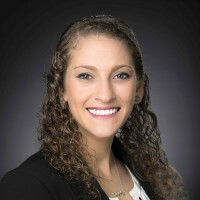 Her clinical practice is within the UF Health Personalized Medicine Program and her research interests include clinical implementation of pharmacogenomics as well as further understanding the role of phenoconversion for optimal medication safety. Bain KT, Schwartz EJ, Knowlton OV, Knowlton CH, Turgeon J. Implementation of a Pharmacist-Led Pharmacogenomics Service for PACE (PHARM-GENOME-PACE). J Am Pharm Assoc.2018 Mar 27. piiSE1544-3191(18):30076-1. Schwartz EJ, Turgeon J,Patel J. et al., Successful Implementation of a Standardized Medication Therapy Management Plus Approach within a Primary Care Setting.J of Amer Board of Family Medicine. 2017 November-December; 30: 701-14. Bain KT, Schwartz EJ, Chan-Ting R. Reducing Off-Label Antipsychotic Use in Community-Dwelling Older Adults with Dementia: A Narrative Review. J Am Osteopath Assoc. 2017 July; 117:441-50. Schwartz EJ, Issa AM. The Role of Hospital Pharmacists in the Adoption and Use of Pharmacogenomics and Precision Medicine. Personalized Medicine. Epub 2016 Oct 18.